After ten absolutely fantastic days of island hopping with Heather, Jed, and Sam, we are back in the Ao Po Grand Marina. In just a couple of hours we will be headed to the airport. I’m sitting in the cockpit writing this log and listening to Heather hum bedtime lullabies to Sam. 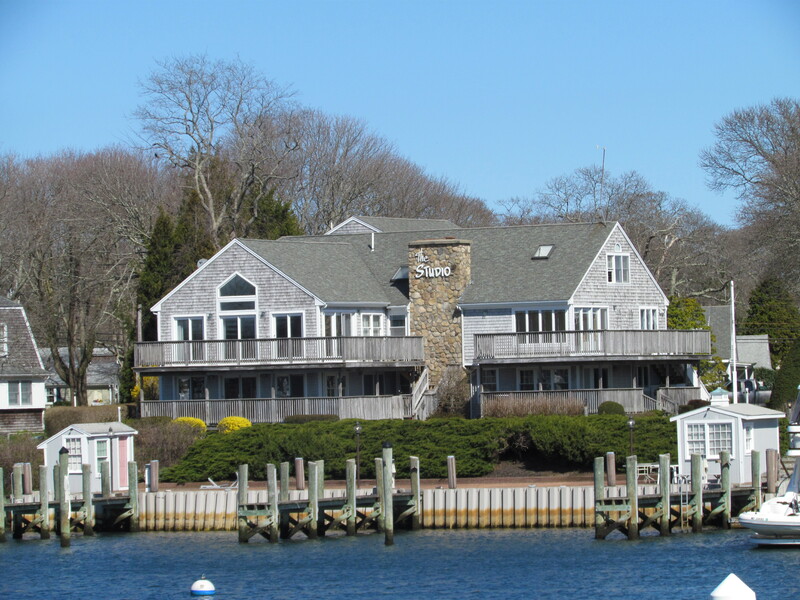 I’m looking at his little pool on the back deck filled with water and beach toys. His little plastic tools are strewn on the cockpit cushions and his bucket of coral and shells that he collected yesterday is sitting beside the tools. We will head to the airport just before midnight and when Mark and I return to Windbird and wake up in the morning and see the pool, the tools, the bucket of shells . . . there will certainly be a huge emptiness in our hearts. Sam really has become a little sailor man and I know granddad will be just a little sad every time he starts the dinghy motor without Sam. Sam LOVES going fast in the dinghy with granddad. And Oma is probably just going to be sad for days. I’ll just have to keep remembering how absolutely wonderful our time together was and look forward to the next time we are together. Easier said than done. Today was just fabulous. Our birthday present to Sam was an elephant ride. So when we arrived back in the marina early this morning, we got ready for our adventure. Sam loves reading about elephants, but none of us were sure he would really want to ride on a real one. But as soon as we arrived at the elephant reserve and Sam spotted an elephant, he just kept smiling and pointing to the elephant and then to himself. Mark and I got on our elephant first, and Sam had not one hesitation about mounting his elephant with mommy and daddy. In fact, Sam had no hesitation about getting out of the riding seat on the elephant’s back and actually riding with Heather on the elephant’s neck. Sam equally enjoyed feeding the elephants after the ride. So the elephant ride was a huge success. We had lunch at the little Muslim restaurant at the end of the marina drive and then Mark worked on getting photos from our last ten days of adventure downloaded while I did the wash and Heather and Sam had a nap. Jed walked up to Chandara Resort for a swim and a little relax time. After nap, Sam played in his pool while Heather and Jed packed. We decided to go into Phuket Town for dinner and returned later than we had planned. So now it is time for a quick hour’s sleep before heading to the airport. So much to do and so little time. Day 91, Year 4: Happy 2nd Birthday to Sam! We did it again. We aren’t where we said we would be. We are not back at Ao Po Grand Marina as we planned, but rather we are anchored off an island very close to the marina. The thought of going back to land was just a little too much for all of us, so we settled on an anchorage close by so we can still be in the marina early in the morning and ready for our elephant riding adventure. We started our day on the James Bond island and had some nice explores in the overhangs and caves. 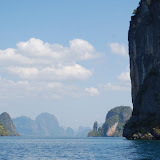 We then moved on to Ko Hong in Phang Nga Bay and explored the hong and caves there-spectacular. We rested while Sam had his afternoon nap and were planning on heading slowly back to the marina once we got up. But then we found this alternative anchorage and away we went. As soon as we arrived we took Sam ashore for some beach time. He had a great time running the beach in his birthday suit and then we all headed back to Windbird for a birthday party. Sam opened presents and blew out the candles on his birthday cake. We ate dinner in the cockpit while watching The King and I. We only got part way through the movie tonight, but maybe we will get to watch some of it tomorrow. It was quite a busy day and we are all exhausted. We explored James Bond island, explored hongs and caves, enjoyed time on the beach, opened birthday presents and had birthday cake.. After all that, Sam had a bit of a rough time going to sleep, but he is down now and maybe he will sleep through the night and give his mommy and daddy and good night’s rest. Unfortunately this anchorage is a bit bumpy. The wind has picked up and we are rocking. Let’s just hope we keep rocking and not rolling. It would be a real bummer to have our last night out be a sleepless one. We made our way north to the anchorage closest to James Bond Island and we are sadly counting down the time we have left together with Heather, Jed, and Sam. But what a surprisingly wonderful day we had today. 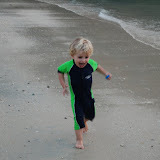 We took the dinghy to the beach on Ko Hong early in the morning to let Sam have his beach play time. He got a bit fussy at one point, so Mark and Jed took him out for a ride in the dinghy while Heather and I walked the Tsunami Evacuation path. When the tsunami hit this part of Thailand in 2004, a number of tourists were killed here as there were no clear paths for escape. There is just a beach and then steeply rising limestone cliffs, so no one would have known where to run to escape. 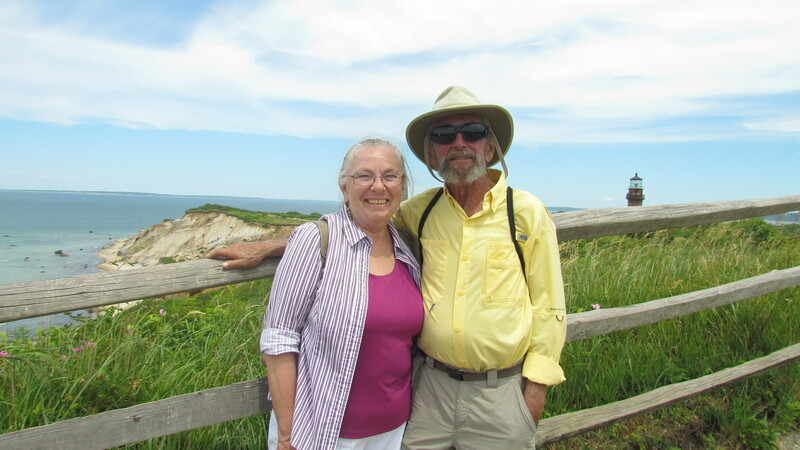 When Heather and I reached the evacuation destination, we both wondered if it would really be a place of refuge as it was only a ledge a hundred feet or so above ground level. But evidently 200 people made it to this ledge and survived. Just walking on the ledge was humbling experience. But it is good to know that the government here has set out evacuation routes on the islands and they have an evacuation tower to signal in case of another disaster. On the more uplifting side of things, we left the beach and headed around the headland to go snorkeling around a rock where Mark and I had seen people snorkeling when we were here with Kevin and Claire. I guess some of the best surprises come when you are not expecting much. We got in the water and found a wonderland of brightly colored soft corals all around this little rock. There were bright red and bright pink soft corals, some of the biggest clownfish I have ever seen, and a very nice variety of fish. I had told Heather and Jed that our snorkeling possibilities ended when we left Ao Nang, but I was obviously wrong. We have only hand one or two other snorkels in all our travels to equal this one, so we were all really happy that we had decided to stop at Ko Hong. After our snorkel, we headed further north into the Phang Nga Bay. We passed James Bond island and anchored a bit north and west. The water is VERY shallow all around the James Bond Island, so you have to anchor a bit away and dinghy in. 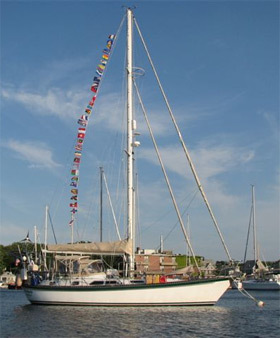 We will do that in the morning, but once we anchored, we decided to just have a laid back evening of fun. We filled Sam’s pool on the back deck with salt water and he had great fun playing in that. Heather, Jed, and Mark jumped in and swam around Windbird just to cool down. When Heather and Mark got out, we threw a beer to Jed so he could have his sundowner while floating in the water. We had and early dinner and just enjoyed life. I know we keep saying it, but it just doesn’t get much better than this. We had another incredible day. The weather has continued to be beautiful and the scenery is just beyond compare. And Windbird definitely has a new commander. The new commander is a two year-old named Sam. He still lets granddad be the master, but Sam is obviously charge. He gets in the dinghy and takes hold of motor handle and then points with this Napoleon-like look in the direction he would like to go. He helps launch the dinghy, steer Windbird when we are underway, and when he has had enough he simply commands, “Stop.” And he keeps us all smiling all day long with his antics on the beach. Today he ran in the water after schools of tiny little fish and would then just flop down on his tummy and crawl through the water. If the water is a little deep it doesn’t bother him. He’s not swimming on his own yet, but it won’t be long. This morning we waited for the sun to warm the water and then took off in the dinghy for the beach at Ao Phra Nang, around the corner from Railay Beach. We arrived at the beach near low tide and decided to walk from the beach across to another small beach on a rock island that was accessible only by walking across the sandbar at low tide. There was no one else on the small island except us and a couple of rock climbers, so we enjoyed the solitude and the beauty. The small island we were on was really just a limestone cliff rising straight out of the sea with a little beach at low tide-very dramatic. As the tide started to rise, we took our things back across the narrow strait to the main island and Mark, Sam, and I took off for a beach explore while Heather and Jed headed out for a snorkel. Mark and I had a great time with Sam and Heather and Jed really enjoyed their snorkel. Sam played in the sand and in the water then we walked to the far end of the beach to Tham Phra Nang, also known as Princess Cave. This is where Buddist and Muslim fishermen have carved and left huge phalluses to assure their safe return from sea. Not sure I understand the concept, but it is certainly an “interesting” sight. 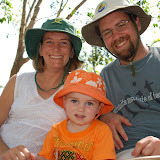 In the afternoon, Mark took Heather and Jed in the dinghy to Ao Nang to do their last bit of shopping while I stayed on the boat with a napping commander. When the shopping crew returned from town, we pulled up anchor and headed ten miles north to the island of Ko Hong, still in the Krabi Province. 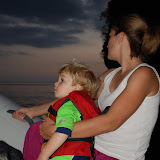 We arrived in the late afternoon and all got in the dinghy to visit the hong. “Hong” means “room” in Thai and they are just a little bay carved out of the island with a hidden entrance. The bay is completely surrounded by soaring cliffs. Sometimes there is only access by way of a cave. We enjoyed the solitude inside the hong and listened to the birds as the sun set behind the rock wall. 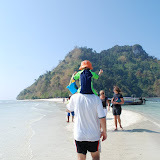 Tomorrow we will have some beach, snorkel, and more hong time here and then we will move on to the Upper Phang Nga Bay. We only have two more days out here. 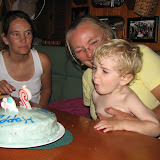 Wednesday is Sam’s second birthday and we will spend that at another Ko Hong in the Phang Nga Province before returning to Ao Po Grand Marina on Wednesday evening. Sam’s birthday present from us is an elephant ride, so we will spend Thursday doing that before H, J, and S fly home. But let’s not think of that just yet. to Railay Beach for a day of fun in the sun. We moved Windbird the mile closer to Railay. It was only 10:30 by this time, but Sam was ready for a nap. It had been a big day already. After naps, we went to shore for lunch and beach time. We found a nice shady spot on one end of the beach where Sam played and found a girlfriend–a twenty-something Thai woman named Kune. She played with Sam for over an hour running down to the water with him and then back to dig in the sand. While Heather, Jed, Sam, and Kune played on the beach, Mark and I went snorkeling. We enjoyed the time in the water but there was not much to see below. They real treat with this snorkel was stopping to look up at the towering limestone karst above it. We did find one cave to explore and I saw one porcupine blowfish but that was it. When we picked up our beach things to go for a walk across the island to Diamond Cave there were lots of hugs and kisses as Sam and Kune parted. We left our beach and snorkeling gear in the dinghy and followed the path across the island. Sam looked so adorable in his little dark blue and bright green UV sunsuit and new blue Crocs with those blonde curls blowing in the breeze. We got to the cave but there was no one in the ranger hut to take our money. That also meant the lights in the cave were not on. I found a local woman who came and tried to help but she seemed to be saying that without the ranger there could be lights. We were all so disappointed, so this is when we took things into our own hands. Mark followed the cable from the cave and saw that it went into the ranger’s room, but the door was locked. Then we discovered a grated-window covered with a poster beside the door. Jed’s arm was long enough to reach through and turn the door knob and sure enough the door opened. Mark went in and found the switch and we were ready to enter the cave. Sam loved making sounds that would echo through the cave and making us all a bit nervous by insisting that he hold on to the hand rail and walk on the rough boardwalk on his own. Heather had to insist that he hold her hand but he did make it successfully all the way through. This cave has some very impressive stalactites and some beautiful golden formations that glitter like diamonds in the light. While we were in the cave, other people followed which put a little hitch in our plan to get out of the cave, relock the ranger’s door, and quietly escape the scene of the crime. Luckily, only four other people entered, so we just waited outside until they left and then covered our tracks. We left the required fee on a table on the inside of the grated-window. I’m sure the ranger will wonder how and why the money appeared. But we left no fingerprints, so I don’t think we’ll be spending time in a Thai prison. It was almost 5 pm when we walked back to East Railay Beach so we stopped for a snack of spring rolls. Mr. Sam can get quite grouchy when hungry, so snacking often avoids the meltdowns. Mark and I took Sam out on the beach while Heather and Jed did a little more shopping. Sam jumped in a kayak sitting on the beach and tried rowing through the sand. Then he stood and watched with great admiration a soccer game on the beach. Our dinghy was sitting right next to the goal net, so we convinced him to stand on the far side of the dinghy and watch to keep from getting hit by the ball. Robert and Tina of Shirena arrived in the Railay anchorage and came to shore. As the sun was setting, Heather, Jed, and Sam played in the water and we talked with Robert and Tina. We were supposed to be heading back to Ao Nang for a nighttime shopping trip, but instead we decided to go back to Windbird and clean up a bit and come back to shore to have dinner with Robert and Tina. The two beach-side restaurants look pretty much identical, but we chose the one with white table cloths. It was a good choice. They were having a Sunday night buffet that we didn’t choose to afford, but the fruit carvings were real pieces of art. We ordered ala carte and had great service. We didn’t know dinner came with entertainment, so we were pleasantly surprised by beautiful Thai dancers. Sam loved this and actually took Heather by the hand and insisted that she get on stage with him to dance when audience members were invited up. The evening ended with some amazing fire dancing on the beach. What a day! Plans for tomorrow changed somewhat as we never made it to Ao Phra Nang Beach and Heather and Jed never made it back to Ao Nang for more shopping. So tomorrow we will visit the beach by dinghy in the morning, move Windbird back to Ao Nang for shopping, and then head as far north as we can get before dark. There are not many days left and much to see, so we will have to make some tough choices. But then we have seen so much already. Sailing in this part of Thailand truly is deliciously beautiful. we have a happy “almost” two year-old, two happy parents, and two happy grandparents. Life is good. The anchorage where we spent last night between Ko Dam Hok and Ko Dam Khwan was just beautiful. When we got up this morning, low tide was approaching and the sand bar that connects the small island we were using as our beach was suddenly connected to Ko Dam Khwan by a sandbar. After eating a huge breakfast, we went over to the small island and walked across the sandbar to the other island. There were long tails by the dozens and hundreds of people on a little island that only yesterday afternoon had only a few tourists. So we just decided to enjoy the beauty and ignore the people and pretty soon most of them were gone. It appeared that coming to the island for the low tide event was the spectacle and once the tide was again rising, the crowds of people disappeared. Heather and Jed went for a long snorkel while Mark, Sam, and I played on the beach. Just as yesterday, the Thai tourists all stopped to say hello to Sam, to kiss him, to photograph him, and to try and pick him up. I think he was beginning to feel a bit like a rock star with so many people just trying to touch him. I haven’t seen this happening to other children, so maybe it is just his age or maybe he really is the most beautiful grand baby in the world until the new grandchildren arrive. Then we will have the three most beautiful grandchildren in the world. In the late afternoon we left our idealistic anchorage and headed over to Ao Nang on the mainland. We spent Christmas Day here with Kevin and Claire and decided to come here to have dinner and then move a mile south to Railay Beach for tomorrow and tomorrow night. We had a great dinner in Ao Nang and did a little shopping. We might go back into town tomorrow morning to do a little food and souvenir shopping and then make our move to Railay. Whether or not it ends up being as beautiful as the last anchorage, it is certainly another slice of paradise. So we just move from one tropical paradise to another. Not a bad way to travel.